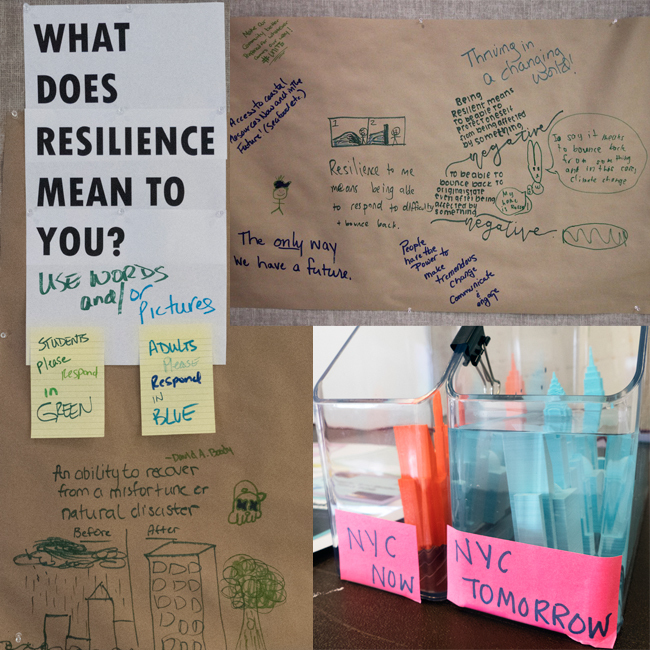 Funded through a 2016 National Oceanic and Atmospheric Administration (NOAA) grant, the Resilient Schools Consortium (RiSC) project prepares NYC public school students for participation in climate resilience planning with NYC practitioners and decision-makers. Credit: Heather Sioux. New York, NY, June 1, 2018 – The first Resilient School Consortium (RiSC) Summit was held in south Brooklyn at City University of New York/Brooklyn College. At the summit, RiSC teams of students and their teachers presented displays about climate and extreme weather and how their schools are affected by climate change, and results of their school and school-community vulnerability assessments. 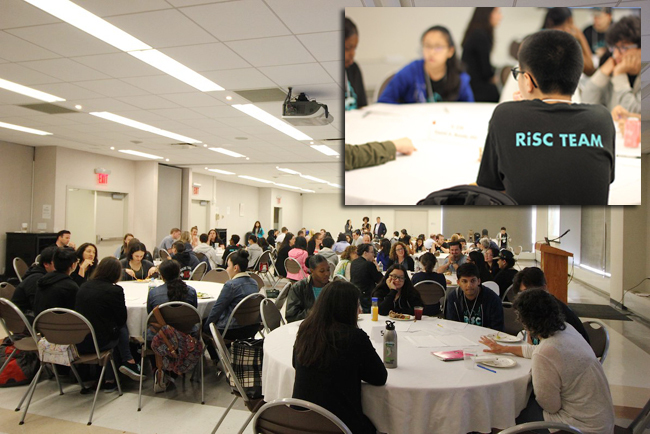 The RiSC Summit gave students the opportunity to share their resilience plans with other RiSC teams and develop communities of practices around weather and climate resilience. The RiSC program seeks to educate students and provide funding for resiliency projects that they develop and to provide an opportunity for youth voices to be heard by climate resilience practitioners and decision-makers of New York City. The program is currently being implemented as both an after-school climate education program and as an in-class honors research program, designed to appreciate and involve perspective from young people on climate issues and provide resources for learning and building resiliency. The project builds on local resilience plans such as OneNYC, and fosters new partnerships among K-12 schools, informal education institutions, government and non-profit organizations working on resilience planning and implementation. The National Wildlife Federation's Chris Hilke talks with students from John Dewey High School. RiSC's partners provide K-12 environmental literacy and climate resiliency plans for New York City’s schools, including south Brooklyn's John Dewey, that help students, faculty and districts prepare for a warming world. Credit: Heather Sioux, NWF. 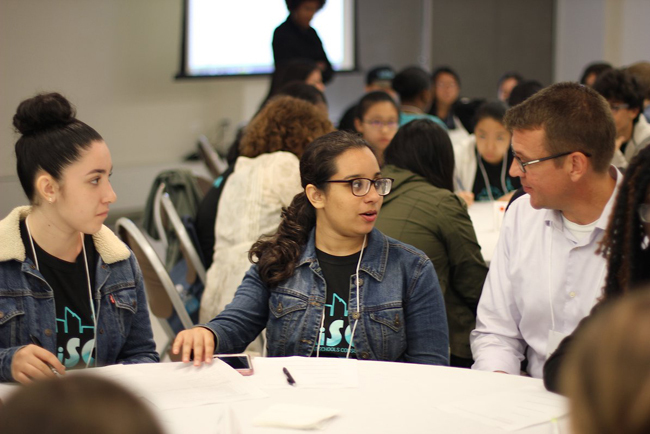 Participants at the summit included RiSC students and teachers from David Boody Junior High School, Edward Murrow High School, Peter Rouget Junior High School, John Dewey High School, Rachel Carson High School for Coastal Studies, and Mark Twain Middle School. The summit also brought the conversation to an inter-generational level, inviting resilience professionals—scientists, government officials, and community from various city and state organizations and governmental agencies—to speak with students as equal stakeholders. Students from each of the participating Brooklyn schools, including (at left) Peter Rouget Junior High School and David Boody Junior High School took part in the pre-summit RiSC Artifacts Showcase. Credits: Ryan Strother, Heather Sioux, NWF. The Summit began with the RiSC Artifacts Showcase. RiSC teams displayed and shared the artifacts they have made throughout the year. For example, the team from Rachel Carson High School for Coastal Studies presented some of the damage that occurred during hurricane Sandy. The school was subject to nine feet of flooding, water damage to the entire first floor. The boiler room was particularly damaged—the school was required to use external boilers for over three years. As a result of Sandy, several improvements were made like raising the boilers twelve inches off of the floor, and drainage pumps were added to remove flood water. Dr. Brett Branco, an Assistant Professor of Earth and Environmental Sciences at Brooklyn College and the project’s Principal Investigator kicked off the event. He led the resilience professionals in a promise to listen to the students and share their thoughts and ideas with them, and the students in their promise to speak with resilience professionals as equals. Meredith McDermott, representing the Office of Sustainability at the NYC Department of Education (DOE) gave the opening remarks for the RiSC summit. She led the students in their pledge to bring their knowledge and ideas, and to talk to the RiSC professionals as partners and equals. Dana Kochnower from the New York City Mayor’s Office of Recovery and Resiliency (NYC ORR) then spoke about the importance of climate resilience and education in NYC schools. Both speakers expressed great enthusiasm for this project and the important role it plays for the future of the NYC DOE and the Mayor’s office. A half dozen Brooklyn schools, including Mark Twain Middle School (at left) and Rachel Carson High School for Coastal Studies (at right) are participating in the three-year RiSC project. Credit: Ryan Strother. Students were then asked to share their findings from their vulnerability audits with the program participants. Earlier in the year, students conducted vulnerability audits and assessments of the climate related hazards their schools, neighborhoods and communities may or may not be properly prepared for. Student representatives addressed the group and identified the top three hazards of concern for their schools and surrounding community. Students, highly familiar with their school buildings, gave apt summaries of their school’s potential hazards and vulnerabilities. A student representative from John Dewey High School remarked, “The only thing between our school and the ocean is Coney Island beach.” As such, John Dewey High School noted hurricanes as a top hazard. As part of their vulnerability assessment, they conducted research on the roof of the school to identify potential hazards. 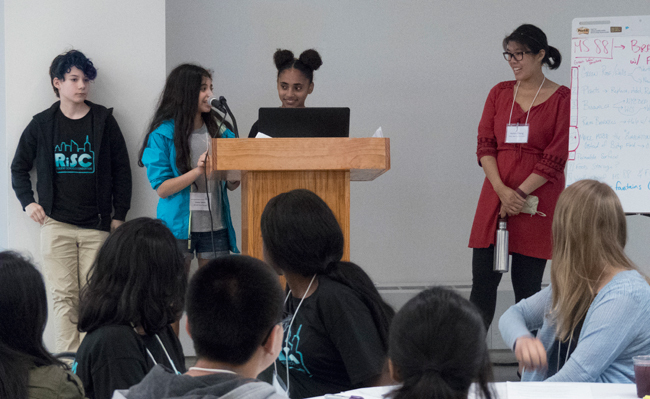 Examples of what resilience means to the students taking part in the RiSC project were in abundance at June's CUNY/Brooklyn College-based summit. Credits: Ryan Strother, Heather Sioux. During lunch, resilience professionals joined the students for conversations about resiliency-related careers. Resiliency professionals introduced themselves and led conversations about the potential for careers in the climate and resiliency realm. Tables were assigned to resiliency professionals, where they gave brief introductions of themselves and their work in the climate resiliency field. Students shared perspective on the resiliency issues facing their neighborhoods, as well as the most rewarding parts of the RiSC program and their plans for the future. Finally, time was allotted for a RiSC Project Design workshop. In collaboration with resilience professionals, students discussed improvement opportunities for their school based on their vulnerability audits. Next year, these students will have the opportunity to design projects with funds provided to the teams. Utilizing their funds, research, and partnerships with resiliency professionals, schools will have the opportunity to build projects to make their schools and neighborhoods more resilient in the face of the increasing hazards of climate change. NYSG’s Coastal Resilience Specialist Helen Cheng (pictured at far right, in red) serves as one of the core team members of the RiSC project and helped design and plan for the RiSC Summit. Credit: Ryan Strother. The RiSC program is a partnership of Brooklyn College, the National Wildlife Federation’s Eco-Schools USA Program, the Science and Resilience Institute at Jamaica Bay, the Brooklyn Marine STEAM Education Alliance, and New York Sea Grant, and is funded by the National Oceanic and Atmospheric Administration Environmental Literacy Grant program.